The Australian Dream or Great Australian Dream is a belief that in Australia, home-ownership can lead to a better life and is an expression of success and security. Despite the fact, the real estate market has cooled, and prices have adjusted and come back from this time last year housing affordability and homeownership in most Australian states is unattainable. Based on the OECD’s price to income ratio index, housing affordability in Australia has been declining since the early 1980s. Similarly, during the same time frame, the number of single parent families have increased, as an example, the total number of single-parent families increased by more than 50,000 over the last 5 years. Did you know that single-parent families are now the fastest-growing family type in Australia? In the last census, 15.8% of all families living in Australia were one parent families. Of that, 18.2% of single parents were male and a staggering 81.8% were female. Historically, the damsel in distress classic theme most notably depicts a young woman in trouble who needs a man’s help. This is however 2018 and do we have a tale to share with you. 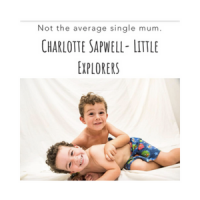 The story of Charlotte Sapwell is anything but that of a damsel, it’s one inspiration, empowerment and victor. 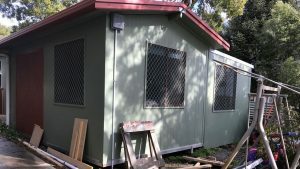 A single mum who was left broke after her divorce and was facing homelessness built her own home for just $13,000. 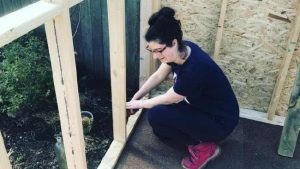 Charlotte was a stay-at-home single mum who had no idea how she was going to make ends meet turned her life around after building a tiny house in her grandfather’s backyard. In the midst of the housing un-affordability crisis, Charlotte went from not being able to afford rent, to becoming a homeowner of a Tiny House. What is a tiny house I hear you say? Tiny houses have the character and functionality of a permanent house and are fixed to the land ranging anywhere from 120 – 500 square feet in size. Usually, Tiny Homes are built by a team of registered builders and carpenters. 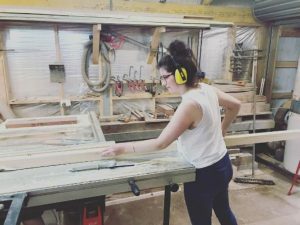 However, in Charlotte’s case, she built it with her own two hands and guidance from her grandfather, an experienced renovator. It has been said that nobody is born a warrior in the exactly the same way however we can make ourselves into one through the resilience, bravery, courage and strength we live through and demonstrate to our children each day. Charlotte had no prior building experience and had even failed woodwork classes at school. 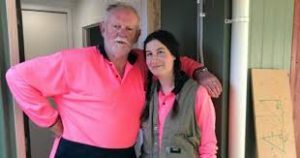 In just six months she went from watching YouTube videos on how to renovate to living in her own home. Kiddipedia is honoured to be in partnership with Charlotte, an inspiration and role model to anyone overcoming adversity and testament that we can achieve greatness when we put our minds to it. Can you tell us a little about what led you to build your own tiny house? Did you have a building background? Building my house came from necessity, my two sons and I didn’t have anywhere else to go. 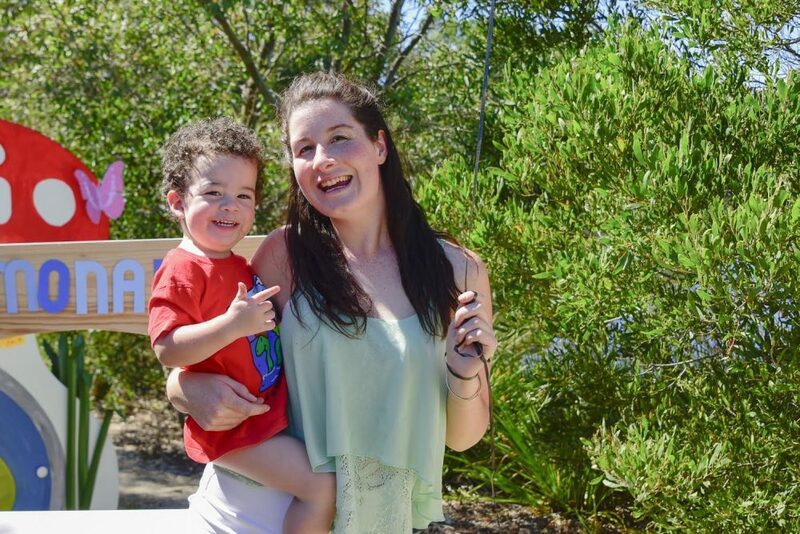 I went from living in a big home with my husband and my kids to an unexpected divorce, soon after we were facing homelessness until my mum and dad offered up their backyard. My grandfather had some renovating knowledge and suggested we convert their old portable office. I failed year 9 woodwork, I had zero experience. My tiny house is actually my dad’s old sight office, the idea of moving into here came from Instagram, Pinterest and the TV shows “Tiny houses”. Of all the houses I’ve lived in before, this is by far my most favourite. 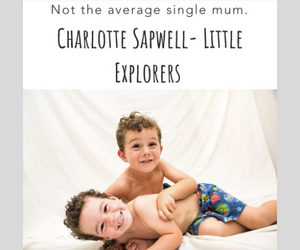 As a single mum you must be super proud of your efforts, has this shifted your perspective on what you are capable of achieving? In such a big way, I say ‘live small dream big.’ I find now that if there is something I want to achieve I never question if I can do it or not. It’s just a matter of time. What a great role model you are for your two boys, what do you hope they have learnt from your resilience? I’ve tried to hard to show them that no matter the circumstances if you have someone believing in you, you can achieve and I believe wholeheartedly that support is the key to success. The Tiny House would promote a lot of outdoor play for the boys I guess. What are your top tips to keep kids busy and playing outdoors? A LOT, we are outside 90% of the time. I recommend buying good quality coats, gumboots and a camera. I believe the key to living in such a tiny space is letting your kids jump in the puddles, climb the rocks and get dirty. We also do a few road trips- exploring new places, even if its just a park that you’ve never seen before. What advise do you have any for any single parents wanting to start something new, but are procrastinating? Go for it, becoming a single parent is tough but you’ve survived and each day you keep going you’re already proving how strong you are so trying something new, something you’re scared of. Whats the worst that can happen? I just want other females to know they are capable of anything. Anyone can build their future. What type of articles should the Kiddi-Community expect from you? Raw and Honest. I’ve struggled with mental health, I’ve faced the risk of homelessness and I parent without knowing exactly what I’m doing. The reality is no parent is perfect, we are all learning and that’s what I love to write about, I don’t want any parent, single or not to feel like they’re alone, or really messed up. As I said “the key to success is support” and I aim to provide that support by showing the real side of parenting. I also love DIY, craft and doing big things on a tiny budget. We understand you’re creating a series called “My Tribe, is Our Tribe”—can you tell us a bit more about it? This is something I’m super excited about, it’s a new series that talks to single mums and women who I believe are an inspiration. I believe in every single person and it’s really easy to feel alone like you’re doing a terrible job, that no one feels the way you feel so through the web series I aim to create a place that shows you aren’t alone via positivity, reliability, honesty and inspiration. If I were a genie and could grant you three wishes, what would they be and why? I wish I could draw because stick figures aren’t really cutting it at the moment and I’m in the process of another passion project. I wish I could be a fly on the wall occasionally. I would love to see how my boys behave when I’m not around. I want to see them play with their peers and learn in school. I wish that everyone felt supported and that someone believed in them. I was so lucky, I am so lucky to have the family that I do.